'Behold Titania' (Ben Hager, deceased, by Adamgrove, R. 2003). Seedling #MD6049-Or#2, MDB, height 4" (10 cm). Very early bloom. 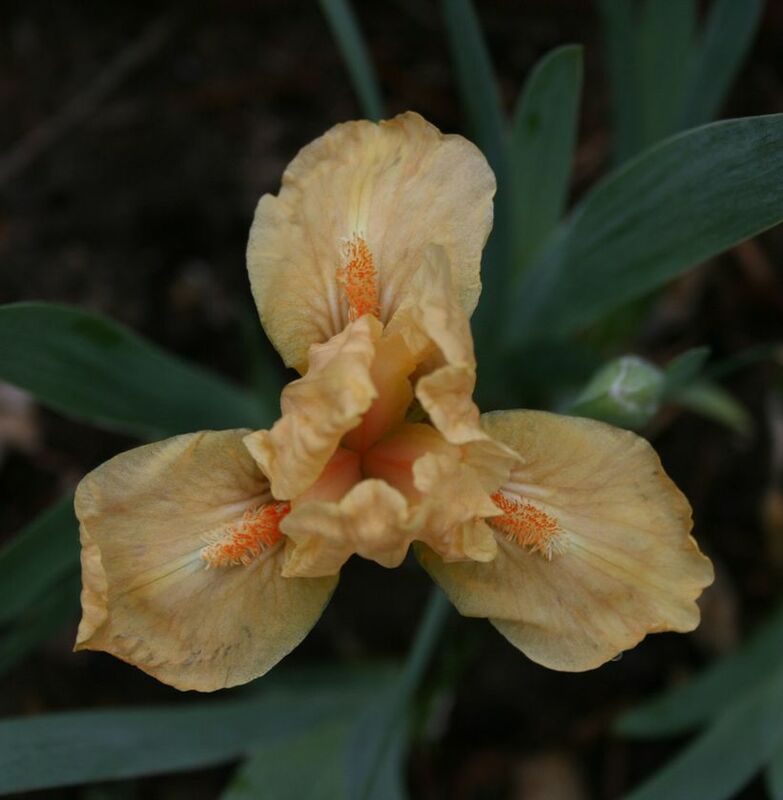 Pale apricot orange self; beards apricot, orange in throat; slight musky fragrance. Seedling #MD5486B-BrtPk: (seedling #AMD4971MY: (seedling #AMD4468, sibling to 'Bitsy' pod parent, x 'Tiny Cherub') x seedling #MD4938Pch: ((seedling #MD3513YBi: ((((('Evening Storm' x Welch seedling #H501) x ('Sulina' x 'Melodrama')) x (('Nest Egg' x 'Progenitor') x ('Brassie' x 'Brownie'))) x ('Idol's Eye' x ('Scale Model' x 'Brownett'))) x 'Buttercup Charm'x seedling #MD3738WApr: ('Pet' sibling x 'Tiny Apricot')) x ((seedling #MD2873BrtY, sibling to 'Pet' pollen parent, x seedling #MD2888Y, sibling to 'Pet' pod parent) x (seedling #M2888TinyYSp x ('Buttercup Charm' x ('Pink Cushion' x Roberts seedling #65-R-28)))))) X 'Coy'. Adamgrove 2003.